Ronin Institute Research Scholars Alex Lancaster, Anne Thessen, and Arika Virapongse have written an excellent article presenting a new perspective on the structure of academia. They argue in favor of abandoning the idea of the career “pipeline” in favor of an “ecosystem” metaphor that allows for a diversity of models of what a “career” looks like and what it means to contribute to the scientific endeavor. We propose an ecosystem as a conceptual model that is relevant both to the training of a scientist and their role as a professional (see figure below). The two most inner circles in the Figure depict the basic necessities, training, and professionalism of science. Here, traditional scientific labs may still have a role, but the networks of peer-to-peer collaborators that span both within and outside of institutions are emphasized. The two outermost circles are the impetus behind the changing context of science today. It is becoming more evident that a new systems-based approach is needed to allow science to adapt more quickly to the complex socio-political and biophysical context of today (the outermost circle). There are, however, now new resources, tools, and infrastructure (courtesy of STEM advances), such as lab space, journal access, and high-performance computing, either publicly available, or available for rent, that allow science to thrive outside of traditional institutions (the orange, next outermost circle). In addition, bottom-up changes are already being driven by early career scientists themselves in many different ways. The article goes in depth into the limitations of the pipeline model and the inadequacies of the solutions that are typically proposed from within that paradigm. It treats the ecosystem model in even greater depth, identifying and proposing new solutions that could be implemented and some that already are, and ends with a call to rewrite the cultural narrative around the practice of science. Changing the cultures of research careers and the scientific enterprise is an experiment itself: actively practicing new a scientific culture can encourage others to be even bolder in their experimentation. The existing institutions that are tasked with supporting basic curiosity-driven inquiry need to be reformed and strengthened, but that alone is insufficient. We must build new structures that are informed by an ecosystem view from conception. The beauty is that science can be made available to everyone and our technologies are making it increasingly so. It is not a scarce resource: we should build our new ecosystem to recognize this truth. Research Scholars Arika Virapongse and Alex Lancaster have put together a survey designed to help us better understand how independent scholars “make it work.” We’ve already begun collecting responses from current Research Scholars, and the preliminary results look really interesting. We’re looking forward to sharing them once the results are in. We also want to open up the survey to anyone who has been doing independent scholarship and anyone pursuing a non-traditional academic career path. If that sounds like you, we would love to get your input on this. Or if you know someone who fits this description, please feel free to bring this to their attention. The survey can be accessed here. The survey takes about 30 minutes to complete. We know that your time is valuable, but we ask that you try to contribute as much detail as possible in your responses. Unfortunately, there is not a way to save your responses and complete the survey at a later date. For the option to work at your own pace, you can preview the questions here. We are hoping that the information we collect will help us to develop new and better ways to support diverse models of scholarship and academic careers. And we would love for you to be a part of that. THOREAU’S “INDIAN STRIDE” Local historian Brent Ranalli discusses Henry David Thoreau’s fascination with all things Native American and the odd fact that at least three contemporaries said the Concord philosopher walked like an Indian. Ranalli presents the results of research into the actual biomechanics of traditional Native American and Euro-American walking styles and their cultural significance, as well as a reconstruction of Thoreau’s own gait based on literary sources. Acton Memorial Library; free. For more than a century, we have relied on chemical cures to keep our bodies free from disease and our farms free from bugs and weeds. We rarely consider human and agricultural health together, but both are based on the same ecology, and both are being threatened by organisms that have evolved to resist our antibiotics and pesticides. Fortunately, scientists are finding new solutions that work with, rather than against, nature. Emily Monosson will speak about some of science’s most innovative strategies and the growing understanding of how to employ ecology for our own protection. Natural Defense, Monosson’s newest book, will be available for purchase and signing. This issue will explore the transnational movement of people, things, capital and ideas, at a time of rising nationalism. The prefix trans means both “across” and “beyond”. Thus “transnational” is here understood as a broad category, including international mobilities across national borderlines, and local rhythms dependent on global networks that supersede the limits of the nation-state. E.g. drug dealing in Manila. Potential contributors should send a 300-word proposal, along with an academic CV, to Jaime at jaime.moreno@ronininstitute.org. The deadline for proposal submissions is 1 December, 2017. What happens at CESTEMER? This innovative conference brings together faculty, graduate students, K-12 educators and professionals in STEM and art fields who are exploring, practicing, and researching performance in science. CESTEMER advances, among these diverse attendees, the practices of community-building, collaborative creativity, diversity and inclusion and their relationship to ensembles. The Ronin Institute, formed in 2012, is a self-organized community of scholars from both the sciences and humanities formed with the core assumption that researchers should create their own measures of success and that affiliation with a conventional brick-and-mortar research institution should not be the sole metric of “success”. As a 501(c)3 non-profit organization the Ronin Institute provides an affiliation for scholars, as well as a financial structure whereby researchers can apply for federal and state grants. In this talk I will share our own steps in cultivating virtual science communities, such as the creation of face-to-face local meetups, participant-driven events like our first Unconference held in November 2016, as well as virtual meetings: a weekly Tuesday “watercooler” and virtual web research seminars. I look forward to learning more from other CESTEMER participants about how we can continue and extend our journey towards creating living, joyful communities of scholarship. While a lot of the academic literature is still paywalled, meaning that it can be hard (and expensive) for independent and non-traditional scholars to access, much of that literature is actually publicly available. Many authors post their articles on academia.edu or researchgate, or even on their own websites. Often, this self-archiving is even permitted under the terms of publication. If you’re just a little bit ambitious with your web searches, you can typically find these, but it does require an extra step or two, which can fell like a bit of a drag. Enter unpaywall, a new browser extension currently available for chrome and firefox that will tell you if there is a free version of the article you’re looking for somewhere out there, even if it is formatted differently (like an arXiv preprint). Check it out! Out today is a nice article in the Careers section of Nature called “Flexible Working: Solo Scientist.” It features the Ronin Institute prominently, and includes quotes from an interview with me, as well as Research Scholars Jeff Rose, Gene Bunin, and Vicenta Salvador. 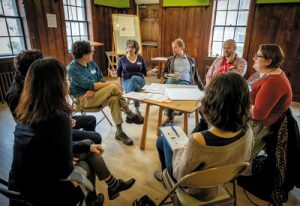 Also prominently featured is one of Gordon Webster’s excellent photographs from November’s unconference. Enjoy!